Have you ever wished your lights would turn themselves on when it goes dark, or that you could double check you haven’t left the hair straighteners on after you’ve left the house? Well, with smart homes and technology becoming increasingly popular, the introduction of ‘smart plugs’ in our daily lives can make this possible, saving you time, money, and worry, all while helping to make life that little bit easier. Let’s start with the basics. A smart plug is a device that plugs into a standard wall socket and lets you control the electronic appliance that is plugged into it remotely via an app. You can actively control it in real time to turn appliances on or off, or you can schedule it to turn appliances on and off at specific times, so you can have total control, all from your phone! 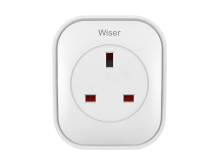 You can now add smart plugs to your Wiser system, so you can control up to 10 appliances within your home, as well as your heating and hot water. If you like the sound of that, here are five ways a smart plug can help you. If you’re going on holiday or are out all day at work and are worried about security, you can use a smart plug to time lamps (and even the television) to come on to help your home appear occupied. This can help to deter would-be burglars, providing more security and putting your mind at ease. With the Wiser Heat app, you can schedule up to eight events per day across your smart plug devices, so you can turn lights off and on, morning and night, throughout your home. Once the kids are asleep, the last thing you want to do is risk waking them up by venturing into their room to turn off their bedside lamp. With the Wiser Plug, simply ‘Ask Alexa’ to do it for you and you won’t even need to leave the sofa! Have you ever run out of the house in the morning, only to question if you’ve turned the hair straighteners or iron off? A smart plug works remotely, so with a quick swipe of the app, you can double check and turn them off (which can be especially handy if it’s others in the house who are the forgetful ones!). Wake up to a brew. Have you ever wished the kettle could be boiled just in time for your morning wake up call? By using your app to schedule your smart plug, you can set your kettle to turn on at 6:55AM, so when you make the journey downstairs, your cuppa will be ready within seconds! There’s nothing nicer than coming home from work and having your evening meal ready and waiting. Connect a smart plug to your slow cooker and you can turn it on from the comfort of your desk, or schedule it to automatically come on, so all you have to do when you get home is eat and relax. Make your Wiser system even smarter with our new smart plugs and you can enjoy all the comfort, convenience and energy savings of app-control for more areas of your home. Buy now on Amazon.